Last Tuesday , we recognized the Harbor Creek High School Juniors and Seniors who were admitted to the National Honor Society. Following a very nice dinner in the high school cafeteria, we retired to the auditorium for the recognition ceremony. 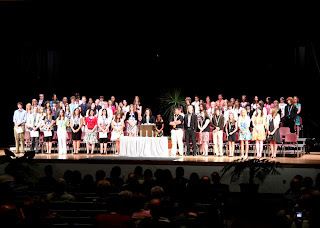 Each student was recognized by name, and the theme, “Candy”, was used as a vehicle to communicate the importance and attributes of the National Honor Society. This group photo was taken just after the students were recognized. I managed to get a shot of each student receiving his or her award, and some images of the speeches as well. This and all of the other photos can be seen on winkflash at http://j1huegel.winkflash.com. This entry was posted in National Honor Society by admin. Bookmark the permalink.